Thanks for evaluating or purchasing Newton CIA. This guide will give you some brief instructions for installation (it’s pretty easy). You can find more details on how to use the software in the Newton CIA User’s Guide. The Guide is available for download as a PDF on the Newton CIA Support page. If you don't have Adobe Acrobat Reader, it is also available on the Support page. Before starting installation, we recommend that you close other programs you have running on your PC. This will help avoid program conflicts that could cause the installation to fail, and will also allow you to accept the reboot request that appears at the end of the installation routine. The download process will place a file on your PC’s hard drive called NewtonCIAvvv.exe (where the "vvv" is the current version number -- for example, NewtonCIA128.exe). After the download has finished, you can start the installation by opening Windows Explorer, finding downloaded file, and double clicking on it. Or, you can click on the Start button, then select Run, and type in the path to the file, along with its name, and click OK (for example, if the file is in a directory on your C drive called DOWNLOAD, you would type in C:\DOWNLOAD\NewtonCIAvvv.exe). This is one of several windows in the installation routine that offer information and/or instructions. We recommend that you read them closely, then select Next. One of these windows will present the End User License Agreement (EULA), which you must agree to before installation will complete. It’s much like agreements you’ve seen on other software packages; please review it even so. Name & Company. You must fill these values in before you proceed. Destination Folder. 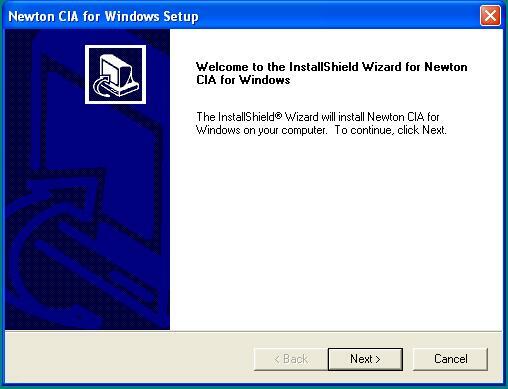 The install program will assume it can place Newton CIA into a folder on your hard drive called CIA. It will give you the option of changing to a different drive name, but the folder name must remain CIA. Selected Program Folder. The install program will normally place Newton CIA in a folder called Newton Computing, which will be available in your Program Menu. You can change to another folder name if you like. Once you’ve finished with these windows, the install program will begin copying files. At the end of the install process, you will be given the option to reboot immediately. Your copy of Newton CIA won’t work properly until the reboot has been performed, but you don’t have to do it immediately if you don’t want to.